A mix of mango, pineapple, coconut milk and passion fruit juice pellets. INGREDIENTS: Mango, Pineapple, Water, Concentrated Passion Fruit Juice, Coconut Milk, Maltodextrin, Sugar, Milk Proteins. Important: If food has thawed, do not refreeze., Keep frozen at -18C or cooler. 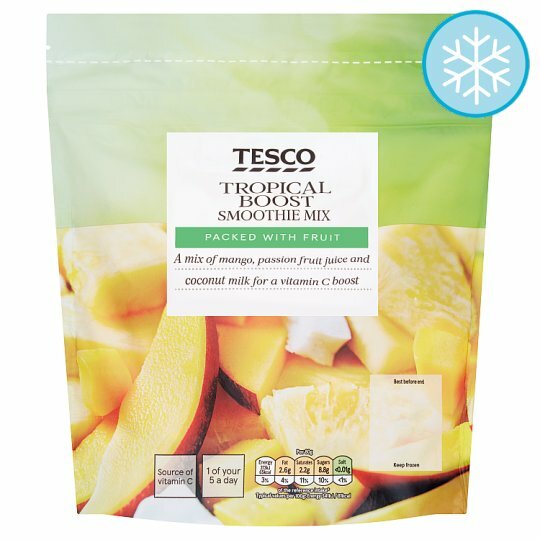 Blend 80g of the frozen smoothie mix (no need to defrost) with 150ml apple juice per serving. Add more smoothie mix if you prefer a slightly thicker smoothie. Serve immediately.